Registration fees include hay and firewood. By pre-registering, you are helping us plan for camping locations, firewood, hay, water, restroom facilities, parking, galvanizing, battle scenarios, etc. Please help everyone have a great event by pre-registering. Thank you. All money collected on behalf of this reenactment is considered a donation and is not refundable. Thank you for your understanding. $150 bounty paid to the first 16 cannons (57 inch wheels only) pre-registered by May 1 and that will be taking the field both days. CS Artillery will be limited to 8 guns total. Any artillery unit wishing to participate after the CS positions have been filled may do so only as US. NOTE: Gun crews may be asked to galvanize as US if necessary. Thank you for your cooperation. The Federal reenactor camp has been expanded and improved this year for camping and vehicle unloading/loading access. 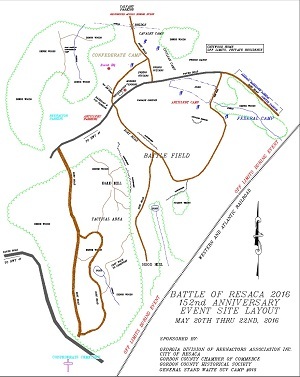 To ensure the safety of all visitors, there will be no tours at the reenactment site during the reenactment weekend that are not hosted by either the Georgia Division Reenactors Association or the Battle of Resaca Reenactment, Inc.
No public solicitation or selling of goods will be allowed except by pre-registered Sutlers and Vendors. This is a public event, and as such by your attendance, you agree that photographs from this event, which might include you, are subject to use by the event and their hosts for marketing of the event. No drones will be allowed on site unless pre-approved by the Resaca Event Staff. Civilians will not be allowed to bring horses unless they have been pre-approved by the Resaca Event Staff to portray or act in a special role during the battles' military operations. The Civilian Camp has no amenities (water, picket lines, etc.) set up for horses. The main reenactor parking is still at the new location for your convenience and for a much shorter walk to camp. A trail head at the back of this area leads to the CS campaign camp. A foot bridge over the creek connects the campaigner area and the static CS camp, allowing easier access to the sutlers. Due to liability issues, the Resaca Event Staff will not allow reenactors OR the public the personal use of any type of recreational four-wheelers, off road motorcycles, golf carts or similar type vehicles to operate on site. Transportation will be provided to and from the spectator and handicapped parking areas. Due to troop camp locations, no MODERN CAMPING will be available for RV vehicles, campers or modern tentage, etc. Modern camping is available at the KOA Campground (10 minutes away) located just off I-75 (Exit 315 - Red Bud Road) at 2523 Red Bud Road N.E. The phone number is: 706-629-7511. Thank you for your cooperation in making this an enjoyable event for all. Please take a moment to review the general event regulations that apply to all reenactors. Please review the following regulations that apply to your impression for the event. Make sure that you have reviewed the above rules and regulations. Print out the following registration form and send it along with your payment to the address listed on the form. Note: If you cannot print the form, contact the Webmaster and we will e-mail you the document. Note: By submitting the registration form, you are acknowlodging to having read the event rules and regulations and are agreeing to abide by them.